When it began there were no e-mails, cell or satellite phones. Long distance communication was by land line, radio phone, regular mail or telegraph. Many rural communities didn't even have electricity, let alone telephone lines. People in B.C. 's Cariboo country were lucky. Most of them owned battery-powered radios. And they had the Cariboo Radio Network. 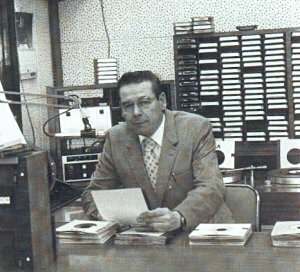 It all started in 1957 with CKCQ, a locally owned A.M. radio station in Quesnel. In 1959 CKWL in Williams Lake was added: to become "The Twin Voice of the Big Country". In 1970 CKBX in 100 Mile House joined to form "The Happy Trio". The owners of these radio stations were local people operating in their own region. They felt they had an obligation to their listeners. So, they provided a free message service to those in outlying areas. Gil McCall, a former owner, describes it as doing something for and with the community. And, what a diverse community it was! First Nations people, ranchers, loggers and isolated homesteaders across the Cariboo and the Chilcotin plateau depended on the message broadcast for vital information. It was widely used, Gil remembers and widely listened to. Most messages were from town-people to those in outlying areas, not from one rancher to another. And, Gil emphasizes, "There were no birthday greetings!" The broadcast covered a vast area. Messages went to Chezacut, Horsefly, Big Bar, Riske Creek, Nazko, the Gang Ranch, Lone Butte, Batnuni, Kleena Kleen, Likely and Lillooet, to name just a few. It was the Williams Lake Stampede song come to life each day. There were heated debates among the announcers about the pronunciation of some names. Was it Savona or Savona? Anahim was usually pronounced "Anaheim" like the California city, but some dissenters held out for "Anaham" while others favoured "Anahem". They all took a run at Tatlayoko and hoped for the best. Whatever the pronunciation, the message broadcasts at 12:30, 6:15 and 10:15 p.m. were the highlights of the day in the Cariboo-Chilcotin. In spring-time the service was invaluable to ranchers and the B.C. Forest Service. Ernest, an RPF stationed at Anahim in 1991 explains; " In spring there was a six-week window for ranchers to burn their range to remove coarse grass and promote growth of new grass. Timing was everything. Dry grass burns fast; at the ideal time ground under the trees would still be too wet for fire to spread through the forest. Left too long, the top spots will dry out, fire will settle into the peat meadows and burn all summer." Every spring the Forest Service did two flights a week over the range in warm weather to monitor snow melt. 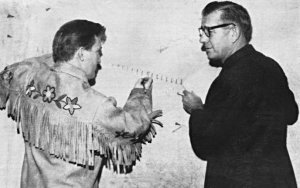 As soon as the flight reports were favourable, Forest Service staff called ranchers by regular phone or radio phone, to advise them to burn. For some ranchers who lived off the beaten path, the message broadcast was the only form of communication. Staff sent a fax to the radio station instructing rancher Smith to burn the Franklin meadow. "How did you know if the ranchers got the message?" I asked. "The next flight over we'd see the meadows were burned!" replied Ernest. Simple, practical and effective. Birthday greetings may not have been allowed, but the accepted messages ran the gamut. Most were down to earth, as you'd expect where people made their living from agriculture and logging. In fact businesses, particularly the Co-op and farm equipment dealers, advertised during the broadcast, because the people listening were the ones they wanted to reach. Equipment suppliers would send out a message to a certain rancher:" Your binder has arrived. You can get it on Thursday." Feed stores would notify people; "The baby chicks are in. Please pick them up." Similarly hospitals would inform parents; "Your children are being discharged. Please come and get them." There was an undertone of haste from both the feed store and hospital because those chicks and children stayed right where they were until someone came to retrieve them! There were a lot of medical messages. People were reminded of dental appointments or advised that their doctor wouldn't be available for a previously scheduled appointment, thus as Gil McCall puts it, "saving some guy from a long trip over the terrible roads in the Chilcotin." Rural communities had very few resident clergy. Their travels to various localities would be announced over the radio. People would be told that Father Coffin was holding Sunday morning worship at Alexis Creek Funerals would also be announced so mourners could attend. Some messages were very dramatic. Ken Wilson, a long-time announcer, recalls a winter plane crash near an isolated ranch. The pilot made his way to the ranch house and sat there, in a snow-storm, listening to the broadcasts of people looking for him, with no way to contact them and tell them where he was. CKCQ employees, Ken Wilson (left) and Denny Reid (Right) stand in front of coverage map showing "Message Time" broadcast area. Another incident, an accident to a Chilcotin rancher, became a nation-wide story. The rancher had gone riding alone to see how his cattle were doing. A bear scared the horse, which threw him. The bear mauled him. He managed to get away and crawled about a mile and a half to the ranch for help. There he was loaded into a horse-drawn wagon and driven another two hours over the rough roads to Anahim where a plane was called to fly him out to hospital. It turned out that the rancher had once played hockey for the Detroit Red Wings in the old NHL. That interested the Canadian media. Ken Wilson and Cariboo Radio broke the story, and the first to hear it were listeners in the remote B.C. Interior. Of course, not every message was about life and death; there were a lot of personal items. As Gil puts it, "It was like listening in on a giant party line!" 'Aunt Mary's arriving from England; meet her at the station in Quesnel.' 'Fred in the Nemiah Valley, your truck's fixed', 'Joe, we'll see you at Lee's Corner, Hanceville, 2:00 p.m. Saturday", 'Sally, meet Art at the ferry, he needs a ride to town.' 'Bruce, you left your gun at the cabin, will you be needing it?' 'We haven't seen old Max for a while, has he been at your house?" Some were just happy messages, like the one from the lady who'd got a new set of false teeth to her friend in the country, "You should see me smile!" Broadcasters were trained to read slowly and repeat phone numbers. The rule was that announcers proof-read messages ahead of time. This, former broadcasters assure me, was never done. There was never time. Since messages were phoned, faxed, and hand-written and often were pretty much illegible, it made for some chancy moments. Occasionally station staff would slip in gag announcements to trick newby announcers who would read along in the most formal voice till they realized the deception. A pause, a burst of laughter, and "oops" went out over the air waves. Sometimes one slipped through anyway which would account for a new RCMP constable being welcomed to the district with the announcement "Constable Jones, you left your clothes at my place last night!" ostensibly from a popular local lady. One message did air, after considerable editing. A tearful woman called with a message for a cowboy on a remote ranch: "Tell him I'm in the Prince George hospital having his baby!" "Umm, well, " hastily replied the announcer on duty , "Some messages are better delivered in person, don't you think?" What was broadcast that day was "So and So in Prince George needs to speak with you as soon as possible about a personal matter." All this, of course, was very confusing to newcomers. When Dianne Benn moved from Victoria to Quesnel in the 1970s her first reaction was "What are we listening to?" Her second? "Lock the doors or they'll be coming at us with banjos!" "How little we know about our own country and province " she thought, trying to adjust to a region where many people had no power or phones and rode horses for transportation. "Here we are, all living in B.C. in the twentieth century, so, who are those people and why are we so different when we live so close to each other?" "In Victoria", she remembers, "our radios were where we heard advertising and music; in the Cariboo, they were a lifeline." Gradually she accepted that and concluded that exposure over the radio was a precursor to seeing with your own eyes. It let down or eliminated a barrier of fear or suspicion. When you met people, you'd think, "Oh, yes, I've heard about them on the radio." "Meeting them for the first time," she muses, "I realized these are people like me, probably more useful and certainly living more interesting lives. At first I didn't understand them. Now, I'd just like to be them!" Even though most people now have modern technology, one or two messages a day still go out on the Cariboo radio stations, continuing a proud tradition of almost fifty years.